Motorola recently announced the Moto E which is the cheapestAndroid 4.4 KiKat running smartphone by Motorola. The phone is powered by a 1.2GHz dual core processor and has a1GB of Ram. It will also get future android updates which are promised by Motorola. A Senior member @deej_roamer of Xda developers has managed to unlock the bootloader and root the device and even ported TWRP recovery on it. 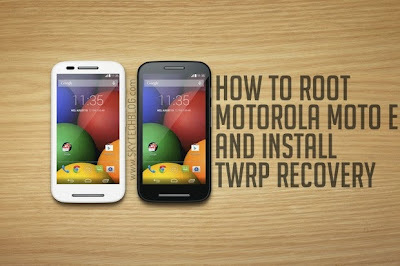 So here is the full tutorial to Unlock Moto E Bootloader and Root it and also install TWRP recovery on it. NOTE:- Unlocking bootloader will wipe your device, Backup your contacts, sms, music, photos etc otherwise you will loose everything. Unlocking Bootloader will void the warranty. TIP:- Go to Settings > Applications > Development > USB debugging” in your Moto E so as to enable the USB Debugging Mode. Battery charge left in your device needs to be a minimum of 80% or else device might get turn off in the middle of rooting. 1. Download mfastboot-v2 extract it in a new folder in your PC. 3. Follow the further steps given on motorola’s site, After clicking on Request an Unlock Key, You will get an email which will consist guideline to proceed further. 4. Clicking on Request an Unlock Key is the point where you lose your warranty. 2. Download the SuperSU from here and copy it into the root of your internal memory. 3. Connect your phone to PC via USB and Reboot to bootloader by pressing VolumeDown+Power button for about 6-7 seconds. 4. In PC o to the folder made in step 1, Do Shift+RightClick in empty space in the folder without selecting anything, Select Open a command window here. 6. Press VolumeDown to select recovery on fastboot menu, then press VolumeUp to confirm your choice to boot into recovery. 7. Now touch doesn’t work in recovery straight away, so wait 60 seconds without touching the phone, The phone screen will go blank. 9. Select Install, scroll down and find the SuperSU Zip downloaded in step 2. 10. Swipe to confirm, wait untill the flash is complete and then select reboot. Now in your app drawer you’ll see SuperSU installed. Congratulations your Moto E is now rooted!